Who invented the Internet should be a really simple question to answer, after all the Internet has only been around for a few years, yet already controversy and the shrouding mists of time are starting to obscure the true record. Most importantly, the Internet and the World Wide Web are not the same thing, and this leads to a lot of confusion amongst people who see web browsing as the whole point of the Internet. In 1989 two scientists working for CERN in Switzerland started working on a concept for sharing research information, they were Tim Berners-Lee and Robert Cailliau. Sharing information prior to the invention of the world wide web meant simply uploading text documents to a file server which other people could access if they knew the precise location of the document. Berners-Lee and Cailliau wrote a proposal for a hypertext language that would let authors of documents add markup letting readers see the document as it was meant to be read, with the inclusion of images, text highlighting, and most important of all, direct linking to related pages. This was published in 1989, and in 1990 Berners-Lee wrote the first web browser that could interpret HTML markup, and used his new HTTP protocol to access pages. The Internet as a network of computers, which is its main function has been in existence much longer than the invention of the world wide web, and was first written about back in 1961 when Leonard Kleinrock wrote a paper which described a process for packet switching. By 1969, the same year as the first moon landing, Kleinrock and a team of engineers created the first ARPANET, a wide area network that is the precursor to today’s Internet. 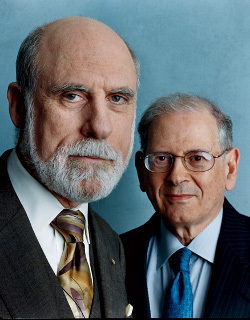 Probably the true inventors of the modern Internet are two Americans named Vint Cerf and Bob Kahn who invented the TCP protocol which controls the way information is sent from computer to computer. Applications such as email, web browsing, or file transfer are handled by the TCP protocol and the Internet could not exist without this technology. For this reason many people consider Cerf and Kahn the true inventors of the Internet, tho they have publicly stated the Internet was invented by many deserving people and dedicate their awards to their colleagues who helped them. In 1999, while appearing on CNN interviewed by Wolf Blitzer, Al Gore, the democratic nominee for President of the United States claimed to have been influential in creating the Internet, a statement many opponents of Gore immediately seized upon as a lie. In fact Gore sponsored the High Performance Computing and Communication Act of 1991 while he was a congressman in the US senate. This act finally removed restrictions to commercial use of the Internet, so in some ways Gore can be included amongst those who directly contributed to the invention of the Internet. Learn about the complete history of the internet.